The ten British universities which conduct the most animal research have come together to proactively publicise their exact figures to the public and media. The press release by the ten institutions was coordinated by Understanding Animal Research. It is the second time that universities have come together to publicise their numbers. Of the 46 universities which are signed up to the Concordat on Openness on Animal Research in the UK, 29 of them have their numbers published openly on the website. These numbers include all vertebrates – every mouse, rat and fish, as well as larger species (but not invertebrates like fruit flies and nematode worms, which are not currently regulated species in any country). 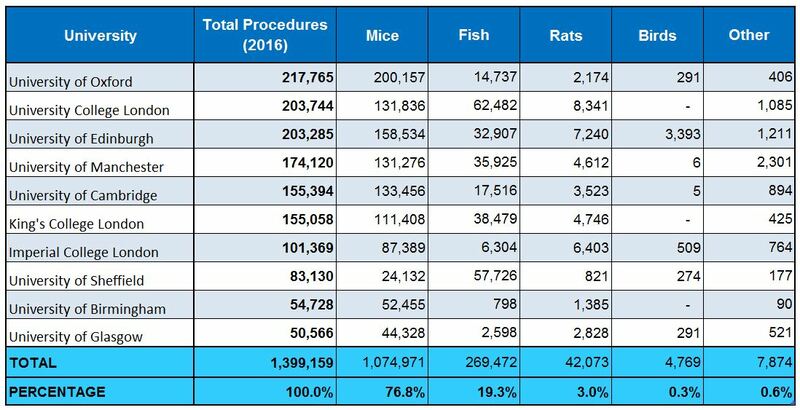 The UK Home Office animal research statistics show 1,938,638 procedures on animals at universities and medical schools in Great Britain in 2016 (Northern Ireland conducted an additional 17,615 in 2015; 2016 figures are not available). Of the 28 that publish statistics (QUB are in Northern Ireland, which produces national statistics separately), their combined number of procedures is 1,703,657. This means 88% of all procedures at universities in Great Britain can be found in statistics freely available on university websites. 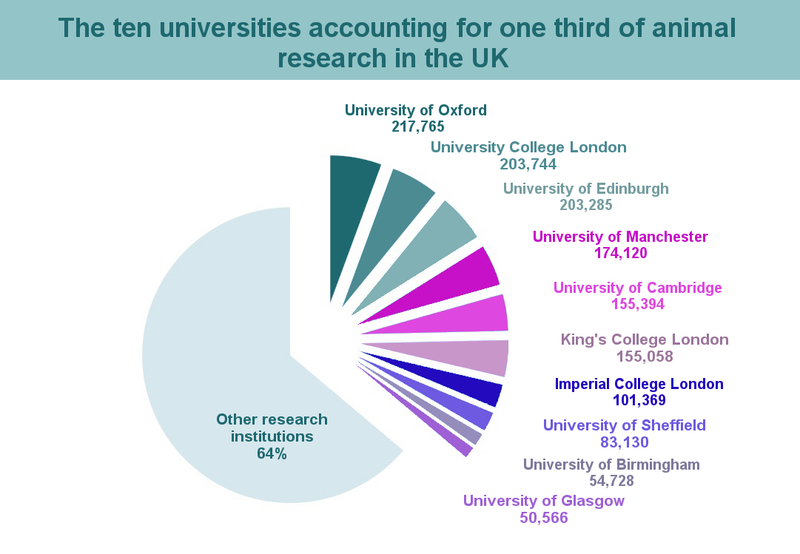 The top ten universities accounted for over 70% of all animal research at universities in Great Britain. The list is remarkably similar to 2016. In fact, the top seven universities have been identical for both years (though slightly reordered). These seven universities are also all in the Top 60 Universities in the World (according to THE World University Ranking; all of the 2016 Top 10 appears in the THE Top 150 Universities in the World). The University of Oxford, which uses the most animals in the UK, is also ranked the top of the World University Rankings. The fact that these ten universities have chosen not only to publicise their animal numbers on their website but also to proactively press release it to national and local press, serves two purposes. Firstly, it shows a commitment to openness, embodied the Concordat on Openness. Secondly, it helps tackle misinformation from animal rights groups that make Freedom of Information (FOI) requests to universities and then press release the results with emotive headlines like “Disappointing lack of progress at UK universities as worst offenders for animal testing are revealed”(By Cruelty Free International). Animal rights groups have often skewed information when it comes to animal numbers in the UK, as happened when PETA described the animals used in the 2015 statistics. By publishing the statistics themselves, the university cannot be accused of hiding away its animal research. It also allows them to provide some context to the numbers – allowing them to explain the types of research these animals are being used for. 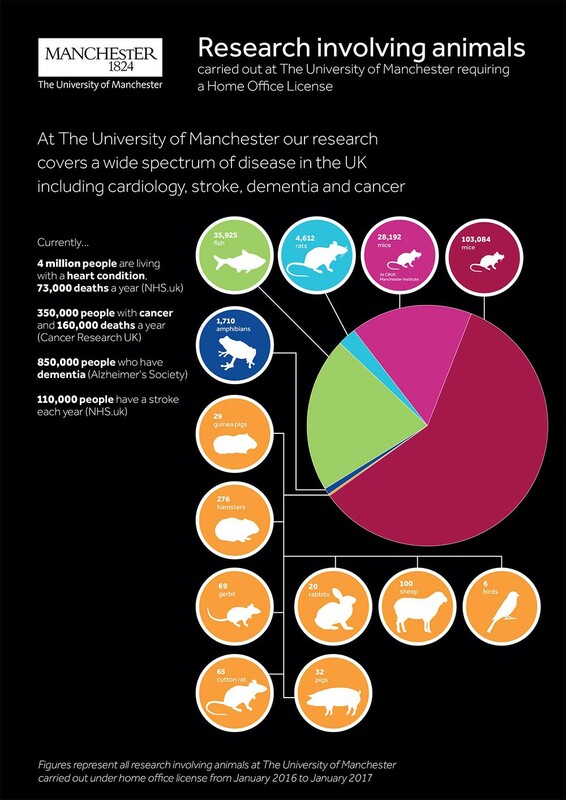 Take a look at this great infographic by the University of Manchester. We hope these universities continue to publicise their animal research in the future. Posted on November 6, 2017 by EditorPosted in News, Outreach News, StatisticsTagged mice, Statistics, Top 10, Top ten, universities, university. 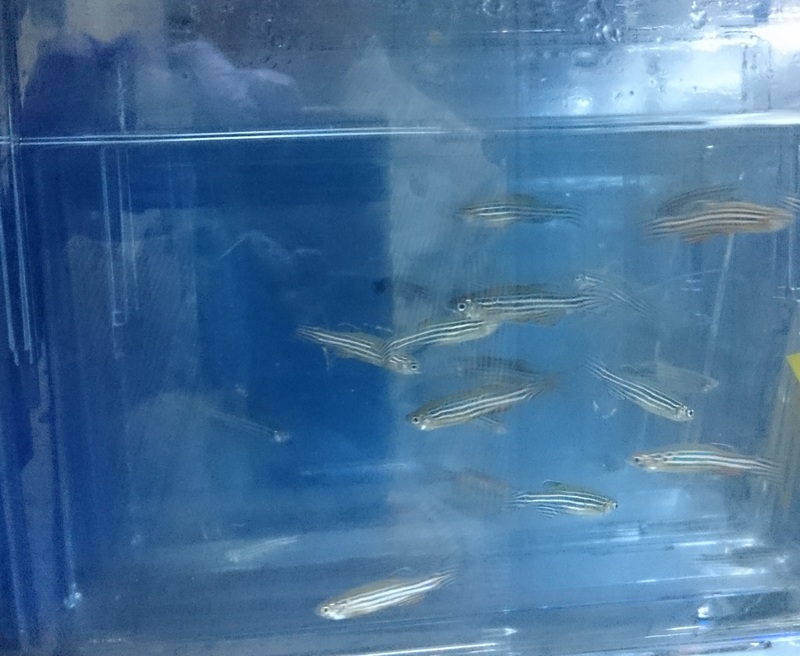 Previous Previous post: Research Roundup: Fishy feelings, young blood and Alzheimer’s disease and more! Do they publish the details of research carried out on animals that the public may be upset by like dogs? If not why? There is very, very little research on dogs by British universities. A small exception exists for the Royal Veterinary College, but all their work will be for veterinary research (often on pet dogs that return to the family after). Most universities publish a breakdown of their species, so you can look at who used what model for research.